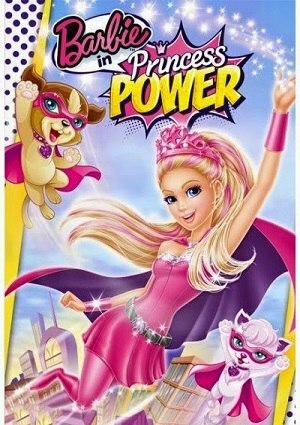 Barbie in Princess Power is the new Barbie movie, a story of super heroes and adventures with that touch of fun, of course! Barbie prepares a lot of smiles for you in her films. This new Barbie movie, she is a princess named Kara, who leads a normal life in her castle, but one day a beautiful magical butterfly gives one kiss to the princess Then, Kara discovers that she is possessed of magical powers which and must fight crime in order to save her kingdom. Among the magical powers, Kara can jump like never, load tremendously heavy things, she can fly, she can do unimaginable things and she is capable of dealing with criminals who are in her kingdom. Super Sparkle is the villain in this story who for some strange reason has gained magical powers, and he wants seek to overcome our heroine. However, Kara and her friends have created a strategy and Super Sparkle fails to carry out his plans: to destroy the peace of the kingdom and the princess. Barbie in Princess Power is a movie created in an environment of action and 3D animation that will surely enjoy in the company of your family and in the comfort of your home.